The NSDA Terrible’s Primm Valley Resorts Spring Nationals concluded on Sunday after four days of non-stop racing action with over 450 entries taking part in one of the largest events ever seen in sand drag racing history. Scott Whipple was the man to beat in Top Fuel defeating Dennis Rieck in the final round with a great 2.335/163mph. 2007 NSDA Top Alcohol class champion Shane Sanford found his way back to the winner’s circle taking home the race win over Mike DeNunzio in the final round. Jeff Mamer made it back-to-back wins in Primm winning a double breakout decision over Billy Morris. Read on for full results from Primm. - Scott’s win was his third of the NSDA season with the Canidae car. - Dennis Rieck ran Low E.T. of the weekend with a 2.330 in round one, and had the best 60’ of the weekend for TF with a .988. - Rick Cameron ran a stout 2.536 in his new car in a round one upset of Shane Switzer. 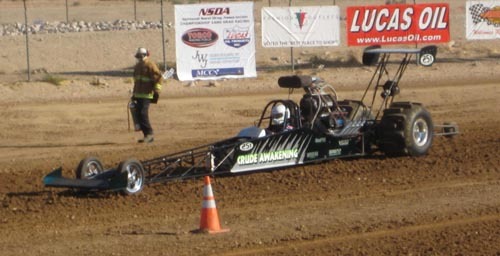 - Pete Schenk had a greatly improved weekend in Primm, running a personal and car best of 2.411 in the Canidae/Turtle’s Toy dragster. - Shane Sanford has now won back-to-back Primm races, also winning in the Fall ’07. - Mike DeNunzio has now been in all four NSDA TA final rounds in the 2008 season. - On race day, Gary Mink’s round two 1.108 was the quickest pass to 60’ of the day. - Rod Trower hurt his motor in the last qualifying session Saturday forcing him to withdraw, which bumped alternate Carey Mahoney into the show. 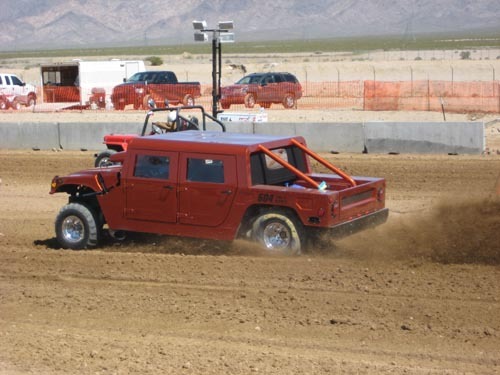 An incredible weekend of racing action at the NSDA Terrible’s Primm Valley Resorts Spring Nationals continued with action on Saturday. Scott Whipple continued to set the pace in Top Fuel by lowering his qualifying time to a 2.372. In Top Alcohol, Dan Allen was the top qualifier with a 2.567, however a devastating crash on that pass will take him out of action for the weekend. Dan was uninjured in the crash as the safety equipment did its job. This bumped Mike DeNunzio’s 2.592 to the top qualifying position. Tim Martin’s Friday 2.950 stood up for the top spot in Top Eliminator, however he would be upset by Lori Ketron in round one. Continue reading for the rest of the day’s results. - Scott Whipple ran a 1.013 to 60’ on his 2.372 pass. - Scott’s final qualifying session pass was a 2.407/136.55 kicking the rods out 1.8 seconds into the run. - The Canidae team has a new engine in the car ready to go for race day. - Shane Switzer made two very impressive passes on Saturday, 2.458/161 and 2.507/156. - Jeff Janoe bumped into the show in style in the final qualifying session with a 2.529/141 with a 1.06 60’. - Charlie Brown went for quite a ride in the first qualifying round on Saturday at the end of his 2.533/145 pass when the brakes failed and he shot down the access road at the end of the track ending up by the starting line of the Best of the Desert event also being held in Primm this weekend. Charlie’s car came out okay, and is ready for race day. - Rick Cameron made a major pass in the third session, shutting off early to a 2.633 after carding a 1.055 60’ time. - John Cadzow made a game effort oh his final attempt running a 2.681/130, falling just .016 of making it to race day. - Terri Blair had another great 60’ of 1.055 in the third session, however her motor gave up down track relegating her to a 2.700 and ending the weekend for the Fugowie team. 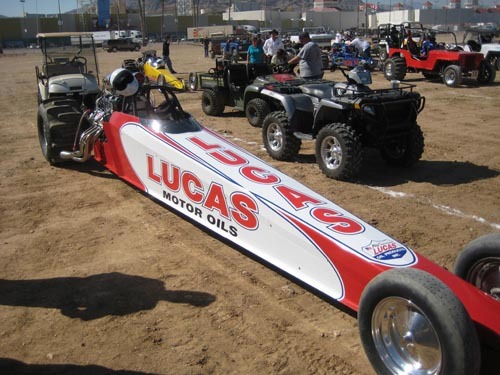 - Dan Allen had a violent wreck in the third qualifying session with his Lucas Oil Dragster. The pass was very reminiscent of his Fall ’07 Primm wild ride, except in the opposite lane. Dan fortunately walked away from the wreck and is none the worse for wear thanks to a chassis that withstood the accident perfectly. - Gary Mink exactly matched his 2.613 in the third qualifying session and had a 1.105 short time on today’s run. - Gary Mink’s 2.613 pass had the quickest 60’ of the day in TA with a 1.085. 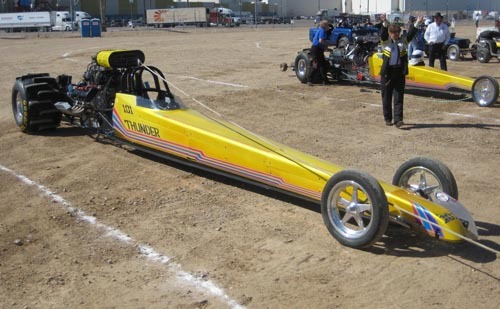 - Rod Trower made a great pass in his DMPE “Thunder” Dragster to end up as the #3 qualifier. - Shane Sanford put the bad luck behind him and ran a 2.623 in the third session. - David Morton is back on track with runs of 2.635 and 2.670, low E.T. of the final qualifying round. - Dee Trower made the decision to double enter in TA & TE and promptly put herself into the TA field with a 2.772 in the first session on Saturday. - After a motor swap following damage to his new Hemi on Friday, Pat Goodale kept his tried and true Chevy motor in the #8 spot running a 2.830 on his only Saturday pass. - Nick Januik and Carey Mahoney went on simultaneous wild rides in the final qualifying session with both cars getting out of shape resulting in early shut off passes which kept them out of the qualified field for Sunday. 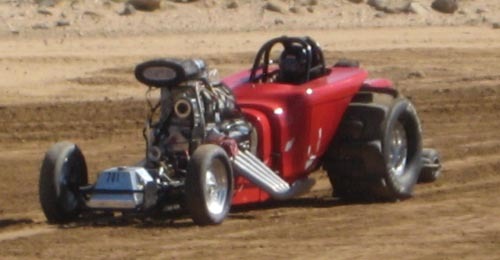 A spectacular weekend of racing continued on Friday at the Terrible’s Primm Valley Resorts NSDA Spring Nationals. As weekend entry numbers climbed up over 400, the action on the track provided to be particularly exciting. In the Top Fuel class, Scott Whipple sets in the top spot after day one in his Canidae dragster with a 2.401. Dan Allen currently is the qualifying leader in Top Alcohol with a 2.583 in his Lucas Oil dragster. Top Eliminator saw some great passes, including two dead-on 2.950 E.T.’s. Tim Martin’s 2.95016 currently edges Steve Hoffman’s 2.95064 for the top spot. Read on for more on the rest of the day’s action. - Scott Whipple also ran the second quickest TF pass of the day, with a first session 2.482/149.52 pass. - Scott ran a 1.035 60’ on his 2.401 pass. - Dennis Rieck ran a solid 2.586 in his lone pass on Friday with a 1.073 60’. - Pete Schenk made a nice first full pass in TF with a 2.665 in the second session. - Matt Ludlow’s 2.670 was second fastest in the first session, but didn’t make a pass in the evening round. - Terri Blair carded the quickest 60’ pass in TF on the day with a 1.025 in the second session, however she had to shut off early to a 3.488. - John Cadzow had an interesting excursion having to shoot down the access road at the end of the track after his 2.833 pass. - Dan Allen laid down his top qualifying pass in the second qualifying round after sitting our the first session. - Mike DeNunzio ran the quickest qualifying pass in the first round with a 2.648. - Rod Trower’s 2.663 in the second session had a strong 1.093 short time. - Pat Goodale and Shane Sanford both experienced mechanical issues on their second qualifying passes. - Nick Januik and Carey Mahoney left before the tree was activated on their second qualifying attempt forcing them to stay put on their first session times. - Tim Martin and Steve Hoffman’s 2.950 passes were the first dead-on TE passes in NSDA history. - Going too fast in the second qualifying session was seen frequently with Billy Morris carding a 2.846, Dee Trower with a 2.805, and Leon Januik 2.936. - Lori Goodale had an encounter with the guardrail in the first qualifying session after the car made a hard move just off the starting line. Enough damage was done to her car to put her out for the weekend. - Lori Ketron’s debut with her new car in TE continued with a 3.231 in the second session on Friday. - Steve Hoffman had the best RT in TE on the day with a .055 in the first session. Primm, Nevada is the place to be this weekend as the National Sand Drag Association holds its annual Primm Valley Resorts Spring Nationals. A huge early turnout could lead to historic entry numbers by the end of the weekend. Grant Fraysier (Pro Bonus) and Phil Soper (Sport Bonus) were the racers taking home the first place trophies in the classes contested on the day. Also, on the day’s plate was test and tune for many of the bracket racers as well as a few of the Top Alcohol and Top Eliminator entries who elected to make passes. Read on for the day’s full recap and continue to tune in each night for daily race updates from the Spring Nationals. Grant Fraysier won the Pro Bonus class. Phil Soper won the Sport Bonus class.